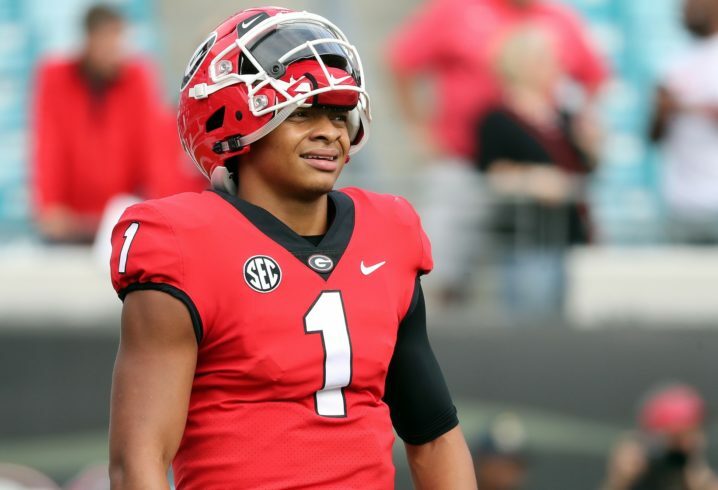 Now that he’s officially eligible to play in 2019, Justin Fields is eager to talk about what a great and welcoming place Georgia was during his lone season in Athens. Considering Georgia has signed a top 10 class for about 20 consecutive seasons, who knew that was even up for debate until now? If you missed the news, Fields has been granted his waiver to play immediately in 2019 by the NCAA. This comes after Fields left Georgia after failing to overtake Jake Fromm and earn the starting quarterback duties in Athens. Fields left the program immediately after the conclusion of Georgia’s season. AKA “thank God I got this decision. Now shut up and leave me alone and I’m never going to tell you anything about how I pulled the race card to gain immediate eligibility”. I harbor no bitterness whatsoever towards Justin and his decision to transfer, and honestly I would’ve fully pursued the waiver knowing how gutless the NCAA is, but it’s frustrating that someone like Justin gets immediate eligibility after a drunk idiot called him a name, but if Jacob Eason ever got called a “cracker” or something like that, he never would’ve been able to pull that card. That’s bc 75% of the school is white.time to move on now. This statement seems a little inconsistent with the ruling. The NCAA should just abolish the transfer rules. As an aside, how do they rule that the culture at UGA is bad enough to justify a waiver and not do some kind of investigation into the school? Yet you had your lawyer ready to pursue a hostile, racist environment plea if if you didn’t get your way. Of course you couldn’t say this before today – it would have de-clawed your appeal. I’d have a lot more respect and admiration for JF if he’d pursued this transfer based on the truth – he wants to play and he can’t unseat Fromm – than taking this twisting, prevaricating route to get him closer to an NFL payday. Pretty much the same ethics as trashing your coworkers to move you closer to a promotion. It it common practice at Georgia to yell racist slurs at players? No, it was a drunk baseball player who was immediately kicked off the team and dismissed from the school. UGA did nothing wrong here. The regrettable isolated actions of one person who happened to be a baseball player should not be attributed to the entire school and doesn’t define the culture. However, it was enough to allow his lawyers to state a plausible case on paper and achieve the results he was after. 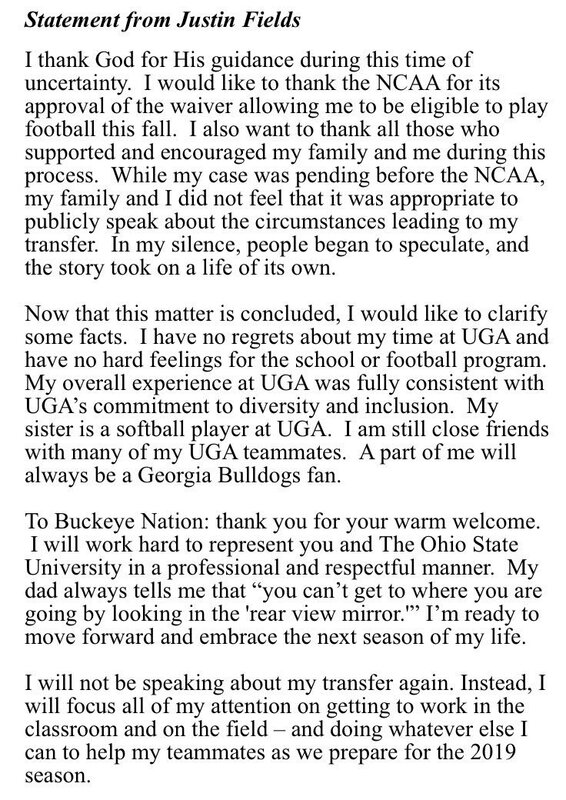 His lawyers did a nice job writing the “Thank you UGA” letter too. The bigger problem is that this waiver ruling transcends UGA, OSU and Fields. It will likely affect most schools going forward – and again, not in a good way. I’m interested to see how the Tate Martell transfer waiver goes. No “race” issues involved there, just another set of facts to be spun by lawyers to get the little braggart to yet another school to see if he can start there. Martell is claiming there’s a new offensive system under the new HC, although the new HC Ryan Day was Martell’s OC for the last 2 years. Same BS, different facts. It will be telling to see how they rule.